Showcase Ireland 2019 this year showed a beautifully produced film Fí of Irish designs, worn in the outdoor irish countryside showing the parallel between nature and our Irish textile fabrics, weave and colours shown in the backdrop of extraordinary scenery. The film was directed by Perry Ogden with Paula Hughes as Creative Fashion Director. Top brands of about 10 menswear designers such as Magee(shirt and trousers), to De Bruir bag, belt and guillet and handmade shoes by Tutty's. Many womenswear designers were from Celtic Tweeds cashmere to jumpers by West End Knitwear, most designers were represented in the creatively produced film. The different chapters of the film Fi showed Chapter Two with the model Somito wearing a scarf by Lou Brennan with Jewellery by Chupi. Then models,both Sadhibh and Cadhla, wore Mohair Cream Top & Skirt by Alison Conneely and in Chapter 7: Suit was by Celtic Tweeds and coat was by De Bruir. This followed into Chapter 8 with Lorna wearing Richard Malone in collaboration with Emblem Weavers. Then in Chapter 9 model Ciara wears the look with Pearl Reddington Knitwear and Cap by Hanna Hats of Donegal and Top &Trousers from 31 Chapel Lane and then Sweater from Ros Duke. Chapter 10 also had a skirt by Ros Duke worn by model Loah with Sweater from Colin Burke. Fí in Irish means "weave": the act of weaving or something that's woven - textiles, stories, and communities closely knit. Ireland's rich material heritage in linen, lace, tweed, leather and knitwear finds a new energy intertwined with contemporary design - sustaining communities and their way of life in a changing world. Bernie Murphy is a talented textile artist and Fi designer who was strongly featured at Showcase Ireland 2019 at the RDS Dublin. Bernie Murphy, Irish textile artist/designer and educator work currently explores the creative functionality of traditional Irish tweeds. She develops new contemporary and innovative approaches to fashion design to identify interesting compositional arrangements in her Sculptural Donegal Tweed Collection. Each garment is an expression of luxury and style in contemporary Irish fashion and textile design. Imagined, designed and handcrafted in Donegal, Ireland. Visit her website at www.berniemurphy.com. 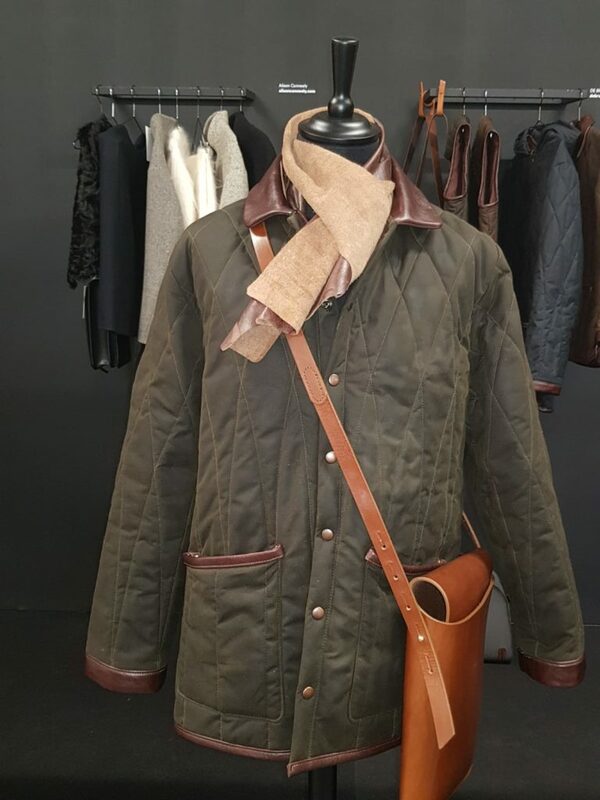 De Bruir were on show with some beautiful all weather rain jackets featuring a leather collar and trim. Situated in Kildare town, Ireland, the DE BRUIR Studio collection of leather bags and accessories combine timeless elegance with contemporary styling. Exclusively made by master craftsman Garvan de Bruir, each piece is individually handmade using equestrian quality leather and simple, pared back, construction techniques. Improving with age and lasting a lifetime, the DE BRUIR Studio collection is now considered a modern classic. Visit their website at www.debruir.com. Alison Conneely designs and produces handcrafted contemporary clothing. Their practice is rooted in the rich textile tradition of Ireland' s dramatic Atlantic coast, and the design philosophy is imagined through a delicate modernist lens. 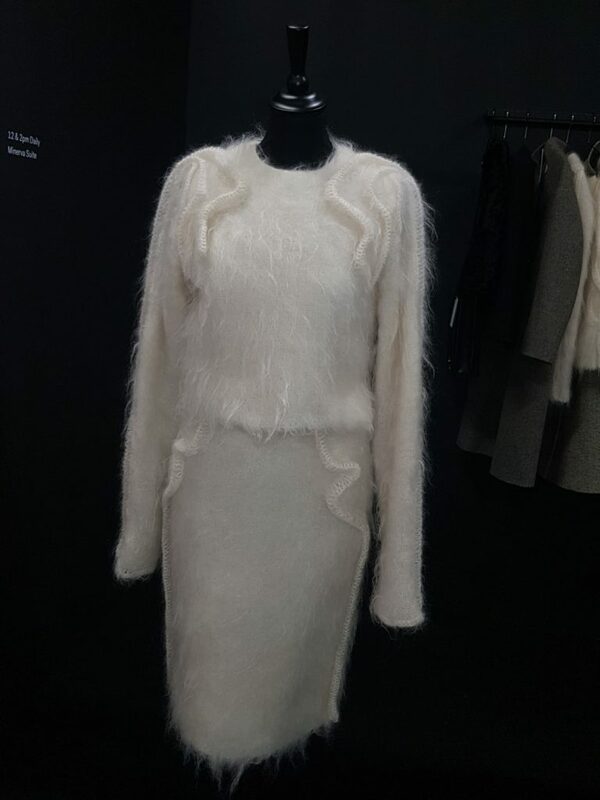 Highlights from Showcase Ireland include an elegant furline jumper-jacket piece. You can see more from Alison including the latest collection - 'An Ailwee Tale' for 2019 at the official website www.alisonconneely.com. Róisín set up her studio in 1987 and moved into the Design Tower in 1988 where she has been based ever since. She is an interdisciplinary artist and leather expert whose label is synonymous with high quality design, innovation and, above all, superb craftsmanship. She holds a BFA from IADT and MFA from NCAD. Visit her site at www.roisingartland.com. The Tweed Project create handmade, one off pieces that combine beautiful Irish fabrics with modern tailoring for a truly authentic expression of Irish design. The collection is made entirely of Irish fabrics, in Ireland for the world. Visit www.thetweedproject.com today to check out their collection.